Do you like underwater sea creatures? So for me the underwater theme has been a very popular design this year, compared to last year which is Minions from Despicable Me. These few months there have been quite a number of underwater themed decorations for me! And I feel that I’m getting better at doing this particular theme. Haha! Which I really enjoyed as it was also the first time I implemented helium balloons into my design! There’s also a few more underwater themed decorations that I didn’t post here, but it’s clear that there’s a trend as almost 40% of my decorations at underwater themed! 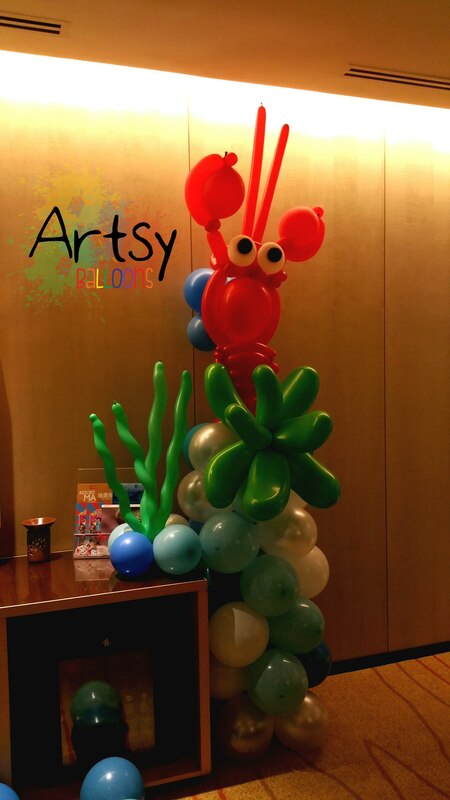 He’s an amazing balloon artist, magician and a entertainer! Definitely a professional in this industry! So for this client there’s no proposal as it’s pretty late minute, just 3 days before the event. So I’m glad that she trusted me to the design! Let me show you the designs now! Here’s the entire room view! It took me around 1 hour and 30mins to complete everything. 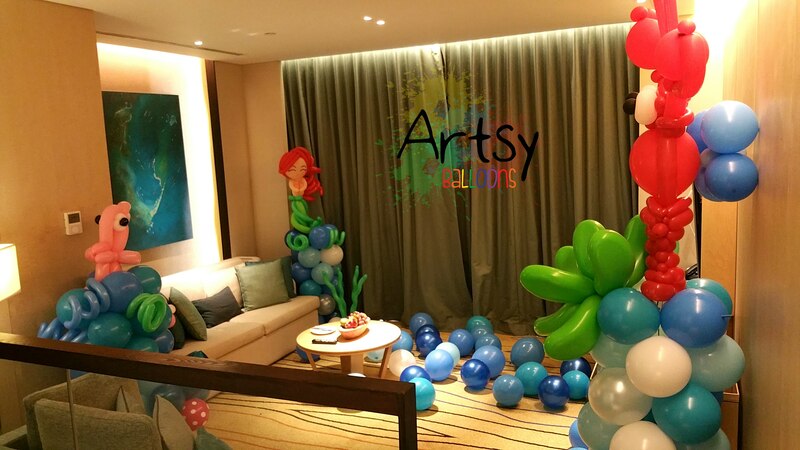 It was a really good condition to create the balloons as it’s a carpeted floor (no sharp objects.) and it’s air conditioned (so the balloons do not oxidise.) It’s a smooth job completed! Alright, that’s my time, I shall be off to sleep now. Tomorrow I’ve to be up early to do some accounting and do up some proposals. And will also be coming up with a few new designs for CNY. Was thinking a some God of Fortune balloon columns and a super large God of Fortune sculpture. Shall see how it goes. Shall end off with a funny sea animal gif. 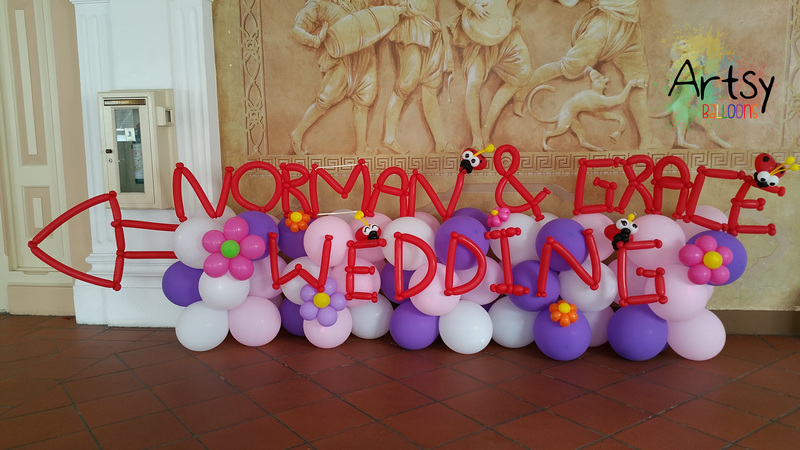 Balloon decorations for Norman and Grace’s wedding! 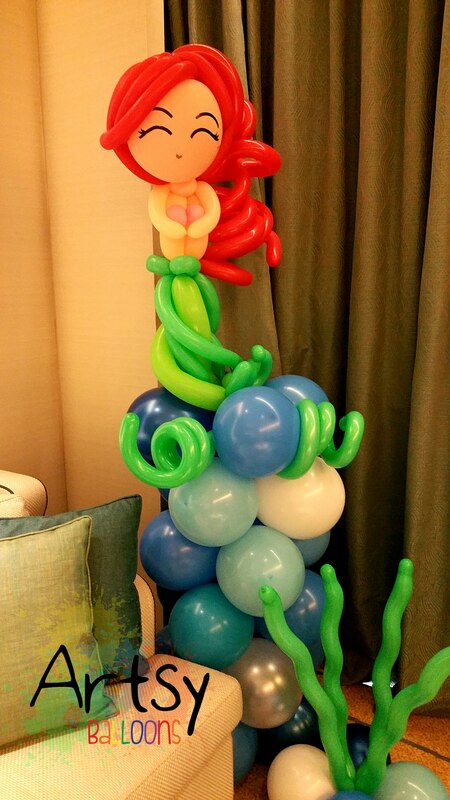 Just finished my 6 hours of balloon sculpting at a local showroom. 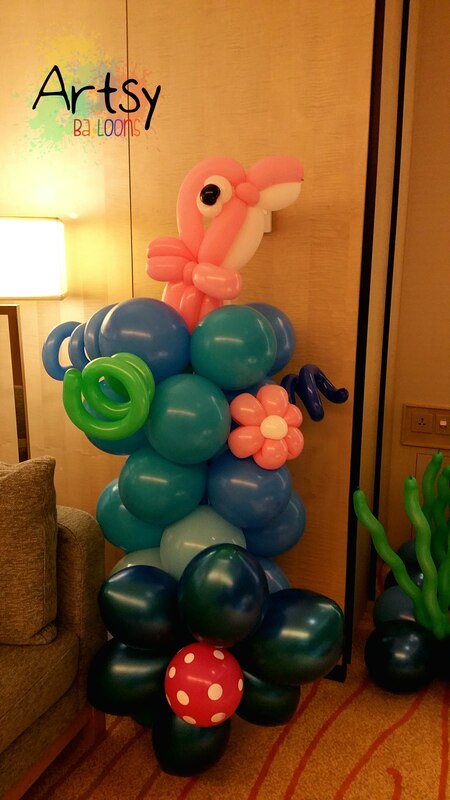 But before I went for my balloon sculpting service, I was at a local hotel for a wedding balloon decoration. I met them 2 months before their big day to discuss about the design and where the decoration pieces are to be placed, and we’ve decided where to place them and I’ve drawn a few proposals for them as well. Here the are finalised ones. And after setting the decorations up for 2 hours. Here’s the end result! This is what’s outside the ballroom. So that’s how people will know that that’s the entrance to the wedding! 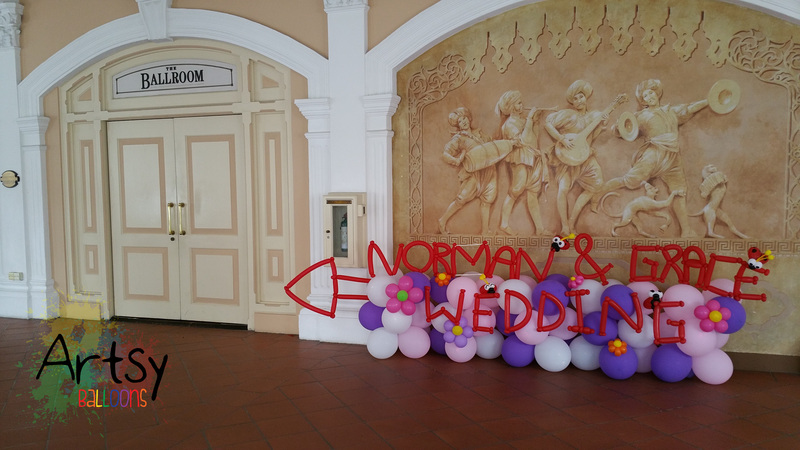 And this idea was created because my client wanted people to know that this is the way into the ballroom without using the traditional methods (eg, boards, signage, directions) and instead using balloons to create a unique and special way to show directions and astound the guests at the same time! 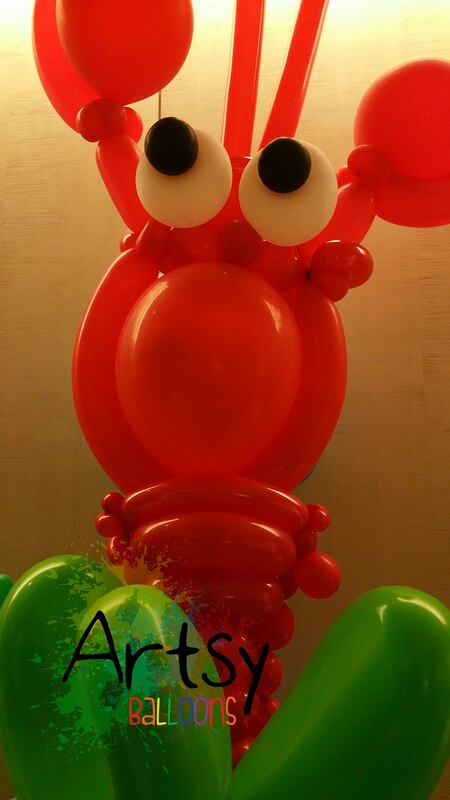 That’s a really innovative way to make use of balloon decoration, it’s a decorative piece, it’s showing directions and at the same time it’s giving the guest a WOW factor, I think that’s a very smart way to do it! And next was what’s on the stage! 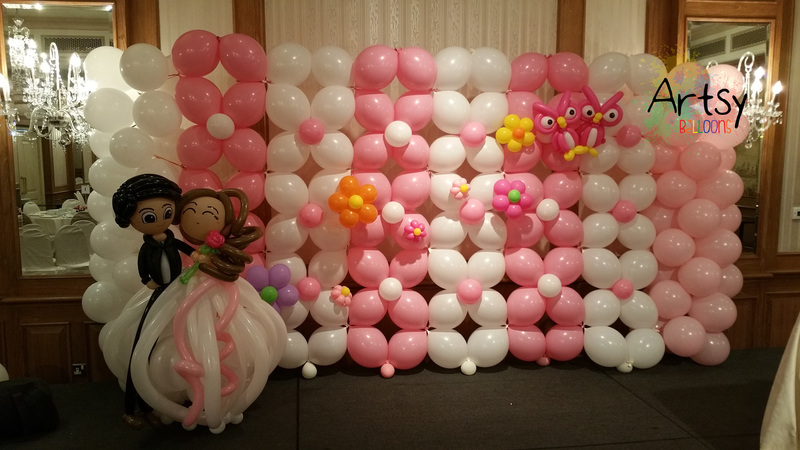 This was on the stage, and my client don’t want the plain walls on the stage, so they wanted this link-o-loon balloon wall which actually are like flowers. And it’s more interesting compared to the plain wall. Next time I should take photo of the before and after of my balloon decorations to let people know how balloons can spice up a venue! 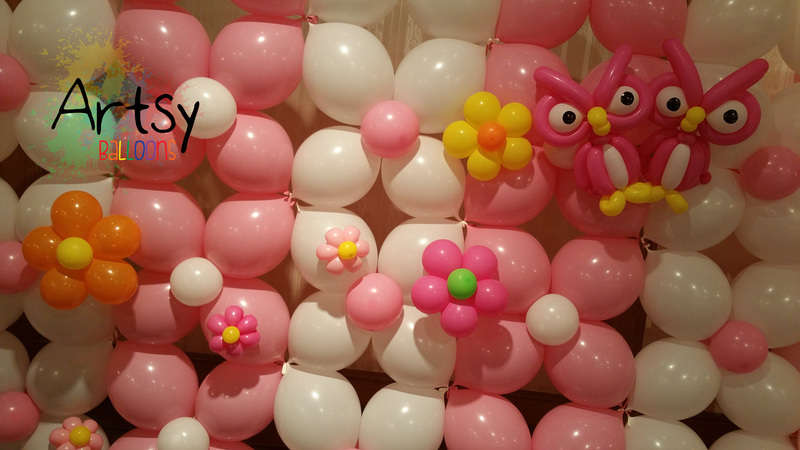 They also wanted owls, and I my client really likes pink and white, so that’s why I did pink and white balloon owls for her, and it’s a couple too! And some flowers on the balloon wall, not too much to spoil the entire backdrop, just a variation of big and small flowers to add a little colour to the balloon decoration. A close up on the wedding couple, they wanted the groom’s eyes to be open, and bride’s eyes to be closed. I think it’s pretty sweet! 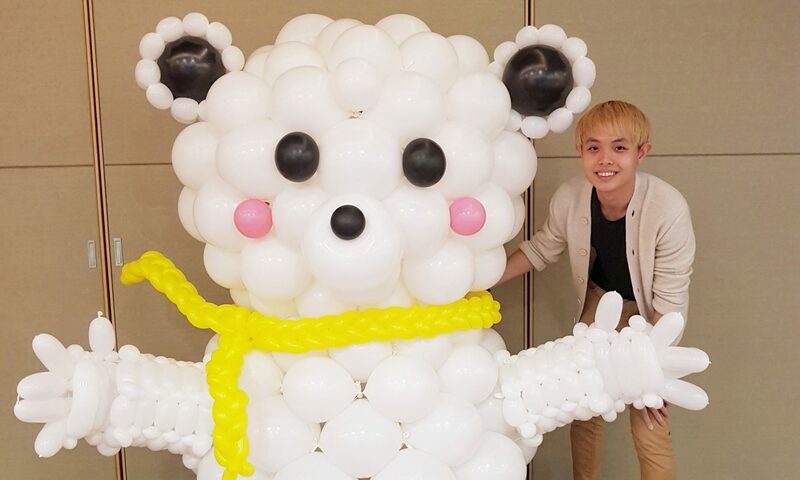 And the amazing thing about the wedding couple is that it can be shifted around, so right now it’s on the stage, but when there’s guest coming in, they can shift it beside the reception table so that people can see it, and after the event, they can just bring back the entire balloon wedding couple home! It’s a amazing piece, and after it’s fully deflated after a few months, you can keep it in a small acrylic box as a memento of your wedding. How sweet! 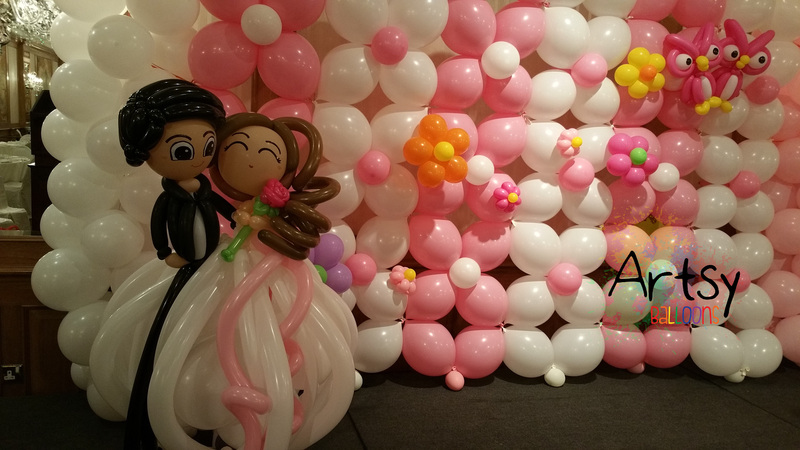 Alright, thank you for reading my blog, I hope that this will inspire you for some wedding decorations ideas, and balloon is what I think it’s the best out of all I’ve seen before. As it’s so vibrant, sweet and colourful. And what’s more is that you can customise what you want! 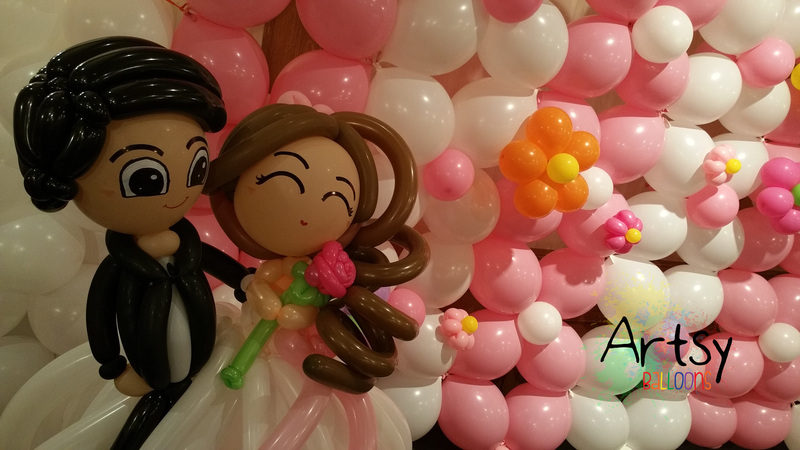 Cartoon themed weddings, elegant theme weddings, coloured theme weddings or anything theme you have in mind, it can all be done with balloons! That’s how awesome balloons are! 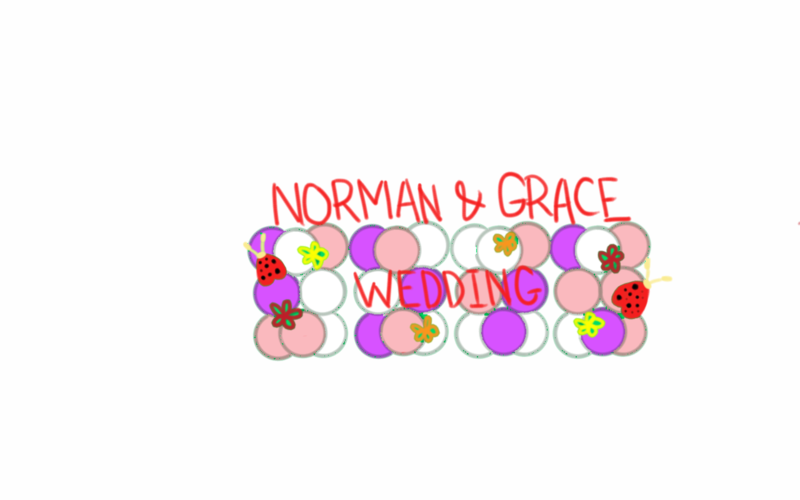 Do you have a wedding coming up? Contact me @ 9677 9426 / Ouji.artsy@gmail.com for more information!